KEEN Athletes have disabilities such as autism, cerebral palsy, Down syndrome and various intellectual and developmental disabilities. KEEN's unique model allows for people with any type of disability, including those with significant needs, to find success. For some of the children and young adults who are unable to participate in other programs, KEEN may be their only recreational activity. All young people with disabilities who participate in KEEN are called Athletes, regardless of their sports skills, abilities or interests. At each KEEN session, athletes are paired one-to-one with coaches (volunteers) for a variety of age-appropriate recreational activities. All ability levels are welcome. The focus at KEEN is on having fun, finding friendship with coaches and other athletes, being active--as active as an athlete can be and trying different things. KEEN coaches can tailor activities to the needs of individual athletes. Athletes are encouraged to play at their own speed and in their own way and to do more by competing only with themselves. In KEEN’s relaxed and supportive environment, athletes can fulfill individual goals and learn new skills. 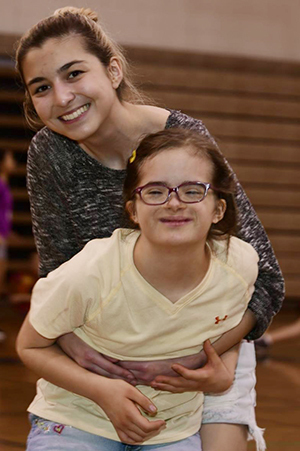 COACHES — KEEN volunteers are high school students (ages 15 and older), college students and young professionals who share an enthusiasm for working with children with disabilities through recreational and sports activities. All coaches are trained by KEEN on how best to work with our kids and supervised at each session. COST — All KEEN programs and activities are completely free of charge to our athletes and their parents and caregivers. KEEN relies on generous contributions from corporate sponsors, foundations and community members. Fundraising events are also held. KEEN PROGRAMS — are open, unstructured and flexible. With the help of their volunteer coaches, KEEN athletes can participate in a variety of non-competitive activities, including soccer, basketball, bowling, gymnastic and various adaptive activities. KEEN volunteers are not required to make a long-term commitment, so chances are, your child will be paired with a different volunteer from session to session. This, we’ve found, actually benefits our KEEN athletes, as it gives them more opportunity to practice their social skills. THE UPCOMING SCHEDULE — View our calendar here. If you have questions about what program(s) your child is in, please email programsdc@keengreaterdc.org. To help your child get the most out of KEEN and ensure our volunteers know how much they’re needed, please arrive on time. Thank you! HOW CAN ANY PARENT OR GUARDIAN BECOME MORE INVOLVED IN KEEN? Parent involvement is a critical component of KEEN. We welcome ideas for parent information sharing and support. We also need parent input for program development and improvement. For more information, email info@keengreaterdc.org.